Welcome to KSCopen documentation site! Here you will find lots of information about the software and tools that support the pilot project. Getting Started on KSCopen is meant to be a sort of “quick start” guide to help walk you through a basic set up. One of the key ideas underlying KSCopen is this: your domain on KSCopen belongs to you and you make the key decisions about how to use it and how you want to represent yourself to the world. So, how do I get a site? For the 2017-2018 KSCopen pilot, you should be faculty with an interest in Open Education or a student enrolled in a class that’s using KSCopen. If you want to learn more about the project or talk about your idea for the KSCopen pilot and how it supports Open Education, contact project leaders, Karen Cangialosi (Biology), Jenny Darrow (Academic Technology) or Mark Long (English). What about the name of my site? I have a domain name, now what? 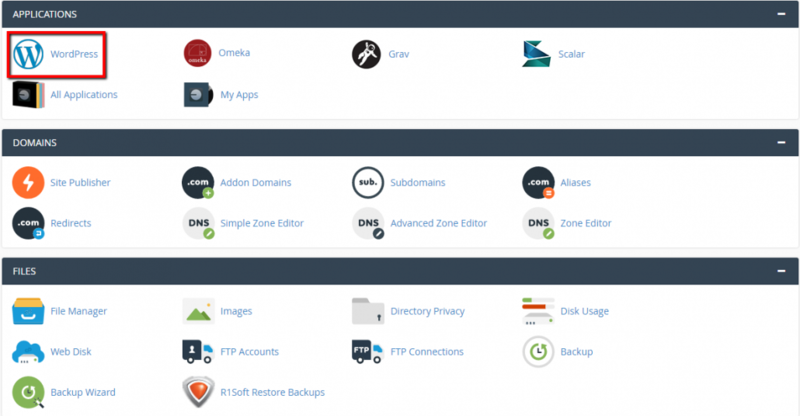 cPanel! Accounts are created manually so allow 24 hours for confirmation email from WordPress with the subject line “your username and password info”. Look in your spam folder if 24 hours elapses without any communication. Click on the first link where you will be directed to reset your password. 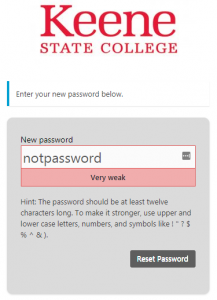 Your password will auto-fill with a super secure password, so unless you use a password management app, you should change it to something you will remember. Remember, this password is not linked to your KSC NetID. 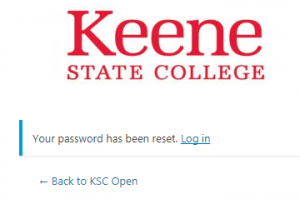 You will be directed to a password reset confirmation screen where you will click the log in link and use the username from the email (username will be their KSC NetID), and the password you just created. What about the name of my website? Choose a domain name that you feel you can live with for quite some time. You should pick something that you’ll be proud of in the future. A good rule of thumb is to pick a domain that you would be comfortable putting on a future job application. There is no requirement that your domain reflect your specific identity in the form of your first and last name. However, choosing a domain name that includes your name may make it easier for you to achieve higher rankings in search engines when someone queries your real name. At the end of the day, your domain should reflect you. Pick a domain you like and are proud of. It can reflect your interests, sports you play, or your hobby. Or it could just be your name. The “right” domain for you is the one you’re comfortable with. Don’t use a course title as your domain: You should avoid choosing a domain name that is affiliated with one particular course–you can always create a directory or a series of pages that are specific to a course. After clicking the sign up button, you will be directed to your cPanel (short for control panel), the administrative area for installing and managing applications on your site. 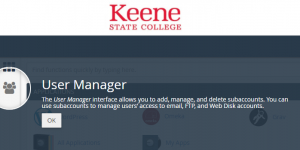 Click the ok button on the one-time user manager screen to access your cPanel. The KSCopen pilot encourages you to install WordPress, one of the most popular publishing platforms on the web, and a platform that can be used for setting up a blog or website easily though eventually you might want to experiment with other applications. To install WordPress, click on the WordPress icon in the top left corner of cPanel. On the Installatron screen, click install this application. Carefully review your installation settings. Most settings can be left at the default with the exception of the advanced section. For this initial installation, you want WordPress to go into your root domain, so it should look like this (but with your domain listed there instead of mine). For now, leave the directory text box empty. You will want to make some changes to this section. It is highly recommended that the username and password created to register your domain name is used here. You can get in a real jam if you are not attentive to the administrative username and password. You can leave the advanced section as is. Double-checked that you know the username and password from the settings section above. Click the install button to install WordPress. You will receive an auto generated email confirming WordPress was successfully installed to your domain. The email is from root with the subject line [Installatron] WordPress installed. No action from you is required. After you install WordPress, you are directed to the Installatron Applications screen. The first link is where you or anyone else can go to see the published version of your site, the second link (ending in /wp-admin/) is one way to login to your site with admin rights. cPanel – You can logon to your cPanel by using the login/getting started link on KSCopen.org. Go to my apps to see links to your site. The second link (the one that has /wp-admin/) will direct you to your WordPress site. 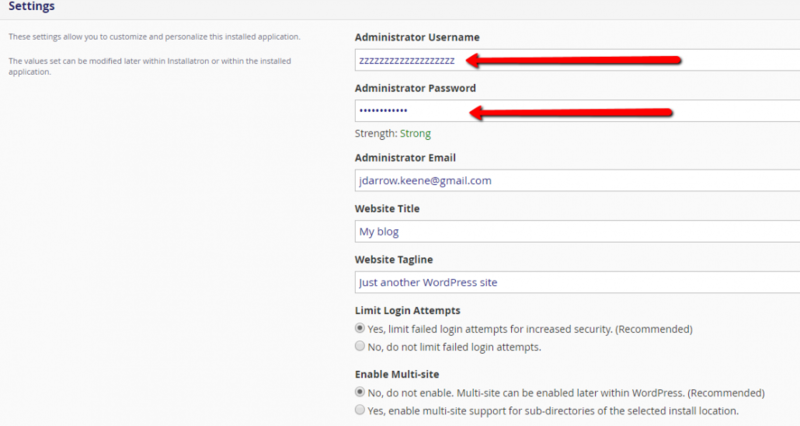 WordPress – you can bypass cPanel and go directly to WordPress. Go to https://yoursite.kscopen.org/wp-admin/ where you will be prompted to login.